It's both fun and functional! 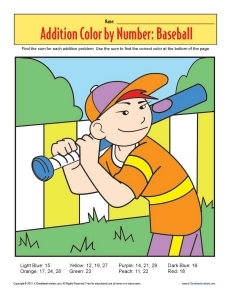 This worksheet combines a cool baseball color by number picture with some basic addition practice. Each space to color has an addition problem to solve. Each sum corresponds to a color. Voila! Fun picture and perfect practice!